It is often required in engineering practice to carry out series of numerical experiments, for example to analyze dynamical behavior and sensitivity of mechanical system or to find out optimal parameters of the system. The built-in module UM Experiments provides tools for advanced analysis of dynamics of mechanical systems. 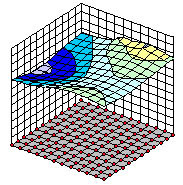 UM Experiments automatizes fulfillment of series of numerical experiments, record course of experiments and save results of experiments on a hard disk for posterior analysis. Thus, the designer is released from monotonous execution of series of numerical experiments "manually" what saves working hours and removes errors, which people unfortunately incline to do. In other words, the researcher specifies the list of paramteres and its limits and a number of points within the limit. Then the project is started and executed automatically. Current process statistics is available during the execution: number of experiments done and time left. Series of numerical experiments are resistant to shut-down of power supply. In that case all results are saved on a hard disk and results of the latter experiments are only lost. There is a possibility to plot an oscillogram of any saved performance of dynamical behavior of a mechanism. Moreover, the designer can plot so-called summary graphs and surfaces. There is no limitation in number of parameters. In other words scanning tool is multi-parametrical. Dimensions of projects are set by the designer so as to solve the specify problem. But on the other hand the designer has to take into account calculating efforts that are necessary for the project. Designer describes parameters to scan (as a rule, it is geometrical, inertia, stiffness and damping parameters), limits and step size for each parameter and starts series of numerical experiments. Scanning saves time history of all selected dynamical performances on a hard disk. These performances are available after the execution of the project. There are special possibilities for scanning dynamical behavior of railway, road and tracked vehicles: with various rail and wheel profiles, various tracks (tangent tracks and curves), various track irregularities etc. Scanning gives an engineer full information about the response surface and the global optimum. It is usually enough to solve an optimization poblem. On the other hand, scanning is very time-consuming process so as it is not practically used for problems with dimension more than 4-5. Scanning supports service of distributed calculations that decreases time efforts considerably. There is a special extension of the module - service of distributed calculations. It allows using all computational powerful of a network for execution of series of numerical experiments that decreases time efforts correspondingly. This possibility is very easy and effective to use in computer centers and laboratories. Server of distributed calculations is based on using TCP/IP that allows employing any computer not only in local network, but also in Intra- and Internet for the needs of your project.